We explain what arrays are and give examples of how they can help children with their times tables learning and to explain the relationship between multiplication and division. I have 3 bags. There are 5 pennies in each bag. How many pennies do I have altogether? The teacher might then explain that rather than counting all the pennies individually, you could work out the answer by counting each line in 5s. The teacher could then point to each line and count 5, 10, 15 to show the children that there were 15 pennies in all. 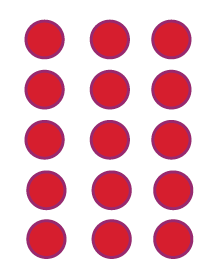 Teachers in Key Stage 1 will teach children how to count in 2s, 5s and 10s and make sure they are very confident in this, before going on to show them how to work out times table problems like this one using arrays. This is because children need to be able to count up in steps of different numbers before they can use arrays to help them. In Year 3, children are expected to learn their 3, 4 and 8 times tables. Teachers may still use arrays for children struggling with their times tables at this stage. Many children find a pictorial representation helps them enormously with working out a worded problem. 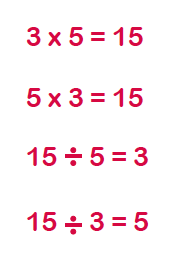 It is important that when children learn their times tables, they also learn the division facts associated with them, so they are not just learning 6 x 5 = 30, but 30 ÷ 5 = 6. Children need to have quick recall of multiplication facts and division facts and arrays can help enormously in the first stages of understanding the relationship between multiplication and division.